Ask any PC expert and they'll all tell you the same thing: you can't buy a decent gaming PC for £799. 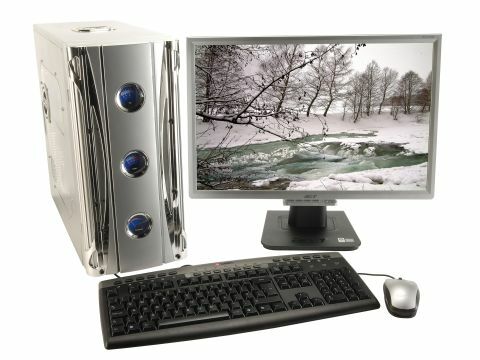 Then again, perhaps they haven't seen the Cyberpower Systems Gamer Infinity XT Elite. It's got the gorgeous looks you need in a silver-grey case, with retro-style analogue dials for voltage, fan speed and temperature. Turn it on and blue light shines from the case window. It's also got the hardware, in the shape of a powerful 512MB ATI HD2900XT display card, excellent Creative T6100 5.1 speakers and even an 802.11g Wi-Fi card thrown in for easy networking. You do pay a price for all this high-end kit: the system requires some high-powered fans to remove the hot air it generates, making this quite a noisy system. Don't give up on it yet, though. There are serious compensations. The ATI HD2900XT graphics card managed some blistering speeds in our benchmarks, returning a 3DMark 2006 score of 10,927. It stomped all over the performances from many of its rivals. Factor in the 2GB of 800MHz RAM and Core 2 Duo E6750 CPU, and this system also came first in the more all-round PCMark Vantage test, although this time by a far less significant 2.6 per cent margin. It's not all good news, though. The keyboard is only average and the mouse proved to be uncomfortably small, so we'd be looking to replace both immediately. Fortunately, this won't cost you too much. On the other hand, extras like the best warranty (three-year return-to-base) are more than adequate compensation, making this system a great gaming choice.